Some of my favorite recipes have been passed down through my family, across generations and three continents. The flavors, mostly Middle Eastern and Eastern European, ingredients and even the methods are familiar and comforting. The recipes passed down through my fiancé’s family are very different from what I’m used to. Both sides of his family came with the second wave of Spanish settlers to the Rio Grande valley in central New Mexico over 400 years ago, and they’ve been here ever since. Their recipes have roots in Spanish traditions mixed with local ingredients and cooking practices. I’ve thrown myself into learning these new and different recipes and methods so that my fiancé can experience the flavors and foods he grew up eating. This arroz dulcé, or sweet rice, is the same dish once made by my fiancé’s great-grandmother—it’s one of those special comfort foods. 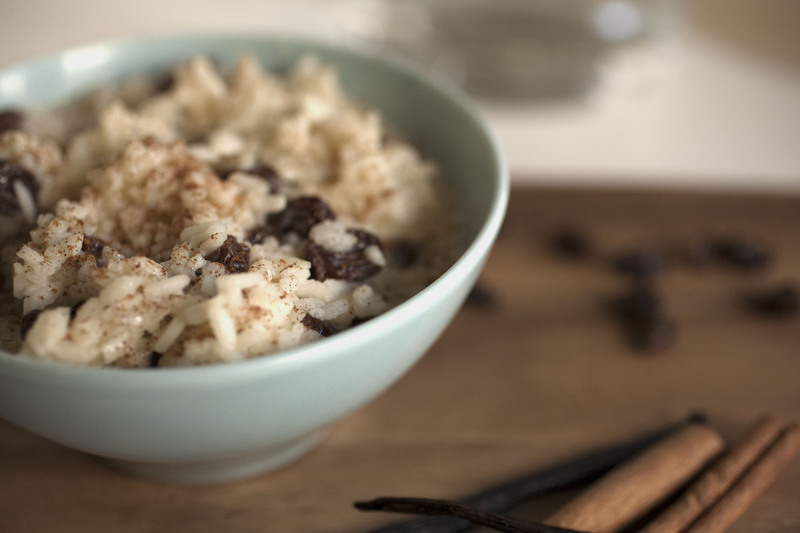 Before I started, I had visions of the rice pudding I’d had in the past, even though I had been told that arroz dulcé was slightly different – not as thick, not as pudding-like, and with more of a bite to it. The rice slowly cooks and the custard just thickens because this recipe uses a double boiler. 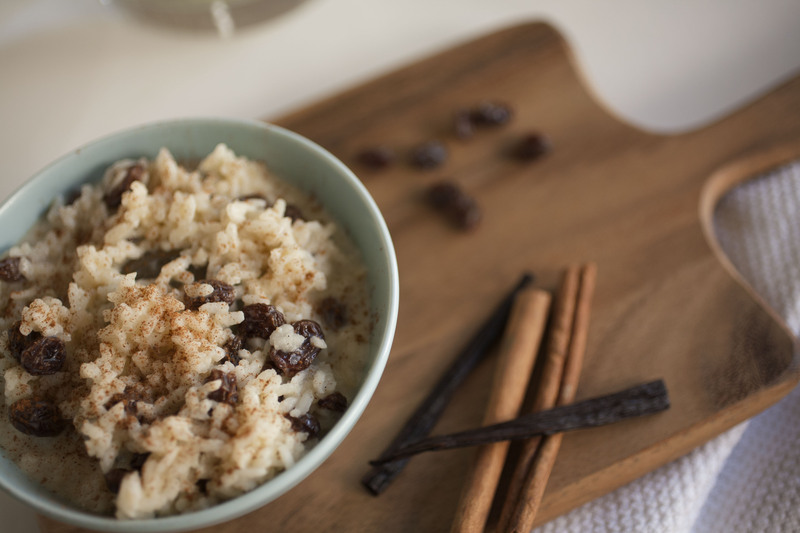 Sugar, vanilla and cinnamon are added along with raisins to sweeten the dish. I cut down on the sugar of the original recipe because I felt it was a little too sweet and added the vanilla bean for taste and flavor, but you can certainly use vanilla extract if that’s what you have on-hand. The double-boiler method is time- and labor-intensive; the rice takes an hour and a half to two hours to cook. But the sweet, smooth, and creamy custard that results is very, very worth it. I made enough for the two of us, but the recipe can be easily doubled or even tripled to feed a crowd. It can be served cold, but it’s definitely the perfect treat for blanket snuggling weather on cold winter evenings. Fill the bottom of a double boiler with water and bring it to a simmer. Add the rice, milk and cream to the top of the double boiler and place it over the simmering water. 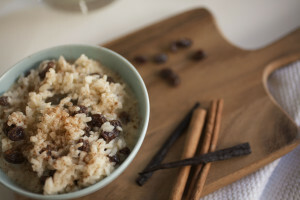 Stir the rice and milk mixture frequently until the rice is tender, an hour and a half to two hours. Whisk the egg yolk and set aside. Once the rice is tender, stir in the sugar and salt. Remove ¼ cup of the milk mixture and pour it in a slow and steady stream into the egg yolk, stirring constantly. Add the egg and milk mixture back into the rice. Add the butter, raisins, vanilla and cinnamon and continue to cook for another five to ten minutes, until the mixture thickens. Dust the pudding with more cinnamon and serve warm or allow it to cool. Kitchen Notes: If you don’t have a double boiler, a small pan filled with water and topped with a glass bowl will work just as well! Previous Post: « Welcome to Flurries of Flour! Hi Abdul. It definitely cost money to start my blog, and I know there are others who spent even more than I did. There are some options out there are free, or at least more affordable, such as Weebly. They’re also user-friendly (I built a website/blog for a client with Weebly and it turned out well). I use WordPress, which isn’t as user friendly or affordable. It has a steep learning curve (I’ve had some frustrating moments), but I have learned a lot about building a website and I believe it looks more professional. Aww, I’m sorry that happened 🙁 Always stinks when it happens. Thank you for taking the time to comment twice though! And thank you for the kind words 🙂 I really appreciate it.